The 19th Annual Exposition of Sculpture Objects and Functional Art Fair is a gallery-presented, international art exposition dedicated to bridging the worlds of design, decorative and fine art. Works by emerging and established artists and designers are available for sale by premier galleries and dealers. If you hurry you may be able to book one of the limited slots in the VIP Conversation by American artists Eric Markow and Thom Norris who were profiled in a recent issue of the National Basketry Organization's magazine Quarterly Review. Reservations must be made in advance. 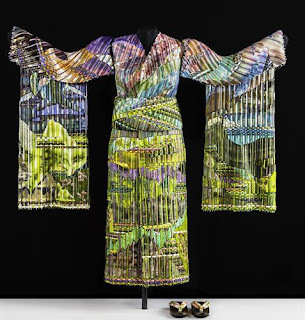 American artists Eric Markow & Thom Norris discuss their very complex glass weaving technique and the inspiration behind their life-sized, freestanding Japanese kimono. Spring Dawn is the third in a series of four hand woven glass kimonos, representing each season at different times of the day. The three-dimensional sculpture is 125 pounds of glass standing 5 ½ feet tall with an outreached arm span of over 4 feet. The sculpture is a technical marvel working large sections of glass into the weave, giving them a larger canvas for the landscape; but still enabling you to see the perpendicular weave, and crushed glass and silver power to create a painterly effect. Artists represented at SOFA by PISMO Fine Art Glass. The Art Fair Company presents the 19th annual SOFA CHICAGO 2012 at Navy Pier's Festival Hall (600 E. Grand Avenue, Chicago, Ill. 60611) Nov. 2 - 4. One general admission ticket of $15 admits visitors to the fair, related lecture series, special exhibits and events. $25 three-day passes and discounted student, senior and group tickets are also available. The public is also invited to the Opening Night Preview, Thursday, Nov. 1, 7 to 9 p.m. Preview tickets are $50. The opening night preview is much anticipated by collectors, museum curators, art advisers, interior designers and architects, artists and cognoscenti, because it offers first viewing and the best selection of outstanding masterworks, as well as the opportunity to meet and mingle with leading members of the art and design communities. The public is invited to enjoy, study and acquire top quality art examples at this year’s preview party. Wine and hors d’oeuvres are included in the price of opening night admission.